Some people might argue with me, but I believe the most important thing that you need when you want to start a garden is the desire to start a garden. If you don’t like dirt, you don’t like a little sweat and time in the sun; gardening is not for you. Check out your local farmers market. So the first step is that you want to garden. Next you need to define what a garden looks like to you. Not everyone needs to dig up all their grass and turn their whole property into a garden. A garden can be as simple as a small container in a sunny window or it can be a couple of feet in your backyard. 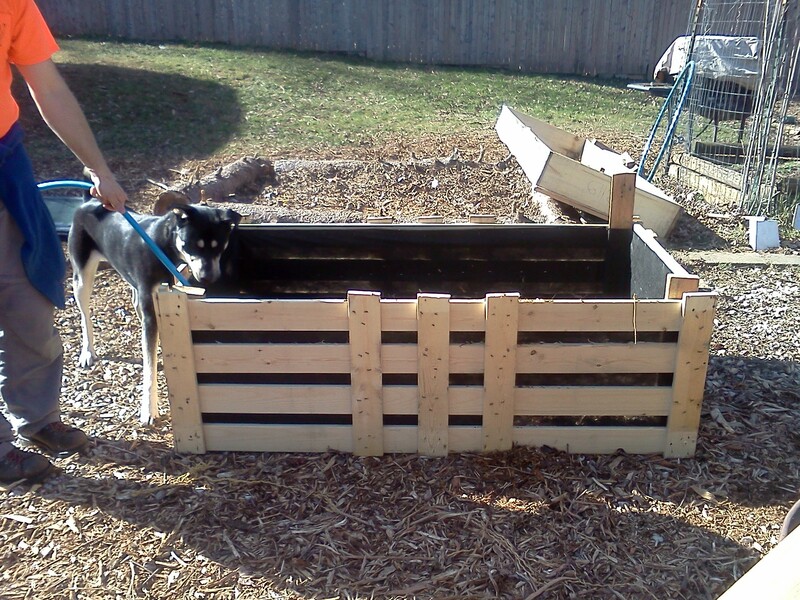 The pallet garden beds that I wrote about in a previous post make a wonderful small kitchen garden. Now, we have established that you like dirt, know the size of your garden area, next you have to think about what you want to plant. Please, I beg you do not plant veggies that you have never tried before, or worse is veggies that you don’t like. Do not plant cucumbers if you do not like cucumbers. Last year I planted 8 cucumber seeds and I got 110 cucumbers… if my family did not like cucumbers we would have had a problem. Lettuce, cucumbers, squash, peas, and beans are all wonderful low maintenance crops. For your first garden, keep it simple and don’t try to do every veggie known to man. Seeds can be bought at the grocery stores, hardware stores, gardening centers, or even Walmart. If you were to ask me which seeds I would choose I would say Seed Saver Seeds, but I started out with Blurpee seeds just like everyone else and they worked great. All of the crops that I mentioned, lettuce, cucumbers, squash, peas, and beans… the seeds can just go right into the ground. Don’t worry about getting an early start. It does not matter if the soil is perfect. A sunny spot with some dirt is all you need. Compost, soil pH, and mulching are all things we can talk about later. In most growing locations you can plant your seeds after the weather starts to turn warm. It is fun to plant and just watch Mother Nature take over. Provide sun, water and some dirt and you will be amazed at what can come out of that little seed. The cool thing is most of the time the seed packet tells you what to do and how to plant the seed. Keep it simple and have fun. Let me know how it turns out. There are many signs of spring, Robins singing, trees blooming, slightly warmer temps, seeds starting…. the list goes on. For the last two years a sign that spring is coming for out family is the sweet cheeping sound of baby chicks in our bathroom. (Yes I said in the bathroom) It has become something that our family looks forward to even though we have only done it for a short time. Six dark Brahma female chicks are living in a Rubbermaid tote in my bathroom Even though we have a great coop outside it is best to wait until the sicks are older to introduce them to the rest of our flock. Plus we love to be very hands on with the chicks. We want them to be used to us, and what better way is there to get acquainted than to shower together! The cool thing that we learned the last time around is by hand raising them we become the mother hen. They come to us for comfort when there is danger. Another plus with our last flock is we had no bullying for pecking order among the chickens. I was the dominate female, not them. We are hoping to be able to duplicate that with these new chicks. I will let you know how it works. Backyard chickens are a great way to teach children about where their food comes from and provide healthy food for your family. With our four birds we get 10 dozen eggs a month and it costs us about $6 in feed. Great return for a little investment. If you are interested in starting your own flock now is the time of year to do it, chicks can be purchased at Tractor Supply, local feed and gardening centers, and on-line through websites like mypetchicken.com. The chicks are only a couple bucks a piece and they truly are a joy to raise. If you have any questions please let me know, I would love to be able to help any way I can. How can you resist this face? I don’t know if we are resourceful, environmentally friendly or cheap, but whatever we are it works. There is a local company that throws away non-standard size pallets, a standard is 4 foot by 4 foot for those of you not up on your pallet regulations. 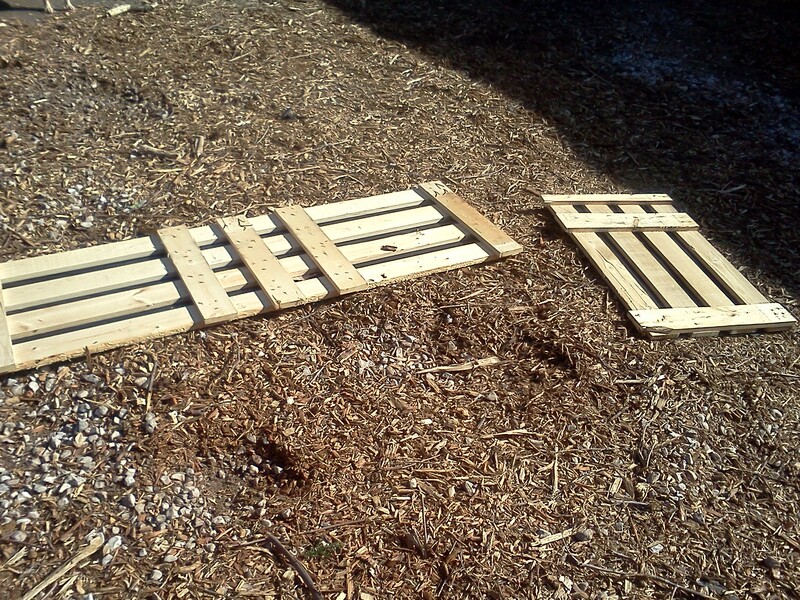 These pallets are 44 inches by 63 inches and I had the wonderful idea to use the pallets to make raised garden beds. And my husband loves me enough to say “sounds great, where do we start!” I gave Ry the basic idea of what I had in mind and he made it happen. The finished product is a 22 inches tall by 63 inches long by 33 inches wide. The finished beds are just tall enough that the dogs don’t want to get in them and just low enough that the kids can still help me plant. So, here is how Ry did it. He started with three of the non-standard size pallets, a roll of black weed fabric, scrap pieces of 2×4’s, a screw gun, a staple gun, some staples and some screws. Ryan cut two of the pallets in half. 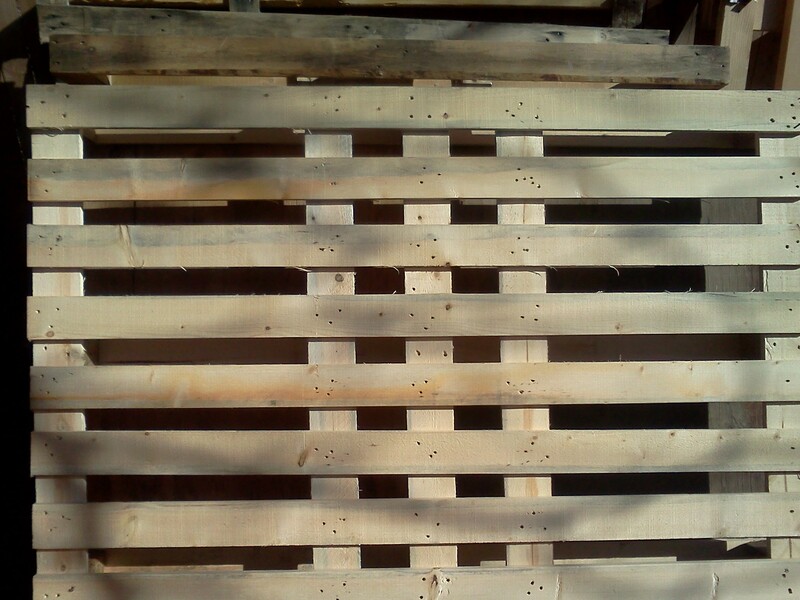 Then the third pallet he cut in fourths. Ry filled the beds with some of our mulch. Search my blog posts for mulch, if you don’t know our mulch from heaven story.) The last 6 inches of the bed he filled with top soil. It took 10 bags. I want to plant root veggies in the beds, if you are not planing root veggies you might not need as much top soil. Each bed cost less than $20 total including the top soil. The picture below is our finished bed with some recycled windows on top. 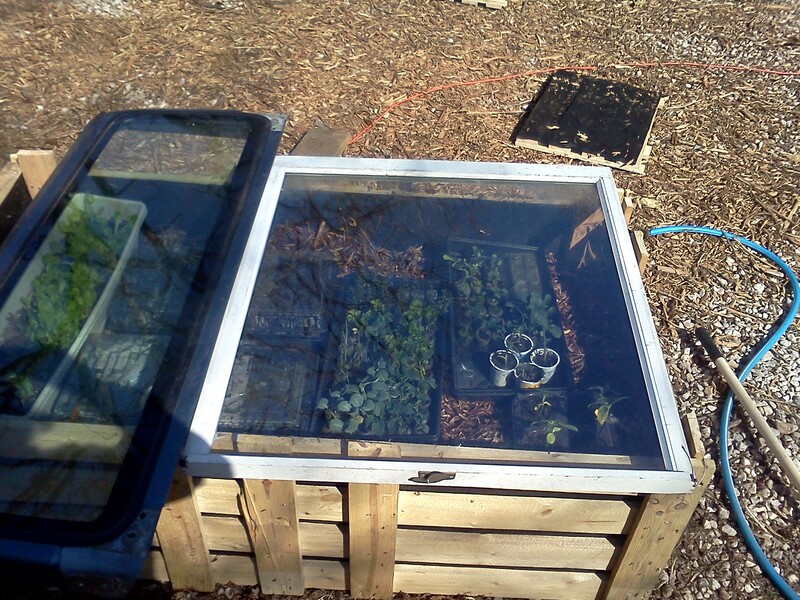 It makes an instant cold frame. We are starting to harden off our onions, broccoli, cabbage, lettuce and cauliflower. I am very impressed with these raised beds. They look great and are an economical solution to our poor soil problem. Most of our backyard is fill dirt with chunks of bricks, rocks and concrete. I am so excited about trying to grow carrots in these beds. I will let you know how it turns out. What have you built with pallets? I would love to hear your ideas. This past summer a friend of mine taught me how to make yogurt and in doing so saved me $450 a year. So being the good friend that I am to all of you, I would like to give all of you $450 dollars. (Feel free to take me out to dinner in order to say “Thank you”.) Alright enough with the small talk, lets make yogurt. One gallon of milk, you choose fat free, low fat or whole. 4 lids to go with the jars, for some reason this always takes the longest in our house, I just don’t understand where those lids go. A pot large enough to fit your 4 jars in. A cooler with a towel in the bottom. Turn the stove top on and let the water boil till the milk gets to 185 degrees. This takes about 20 minutes depending on your stove top. Turn off the stove top and place the lids on the jars of milk. I have learned the hard way that this milk is really hot, I put the lids on now to prevent splashing when I remove them from the pot. Place the jars of hot milk on the counter and let them cool till the milk is 110 degrees. This takes about 2 hours depending on the room temperature. If you forget about your milk, it’s ok, at this point it is just milk. If you have to heat it up again to 185 degrees and start over. After you remove your jars of milk from the pot, put a lid on the pot and place it in the cooler. Once the milk is 110 degrees add two tablespoons of starter culture, for those of you who are not paying attention that is your store bought yogurt, to each jar. Stir gently. Remove your jars from the cooler and put them in the fridge. Let them cool and enjoy. At this point you can add sugar if you must, fresh fruit, cereal, granola… whatever you like on your yogurt. The best thing about making my own yogurt, other than the $450 it saves me a year, is that I know whats in it. I can control how much sugar the kids get and how much I get too. Heat milk in jars to 185 degrees. Add 2 scoops starter culture to each jar. Put in cooler for 8 hours. My favorite way to enjoy the yogurt is with applesauce, crushed almonds and cinnamon. It tastes like apple pie. Enjoy your yogurt and your money!! Let me know it turns out. And please feel free to ask questions. I have never been so happy to see snow. I mean when I was a kid and I did not want to go to school, I would do the snow dance, pray for snow and even wear my PJ’s backwards. And when if finally snowed and I got to miss a spelling test I was happy, but the happiness I had in my heart Saturday morning goes deeper than that. First let me start by saying I am not a cold weather person. In fact I do not think snow is fun, in my mind it is just cold and wet. 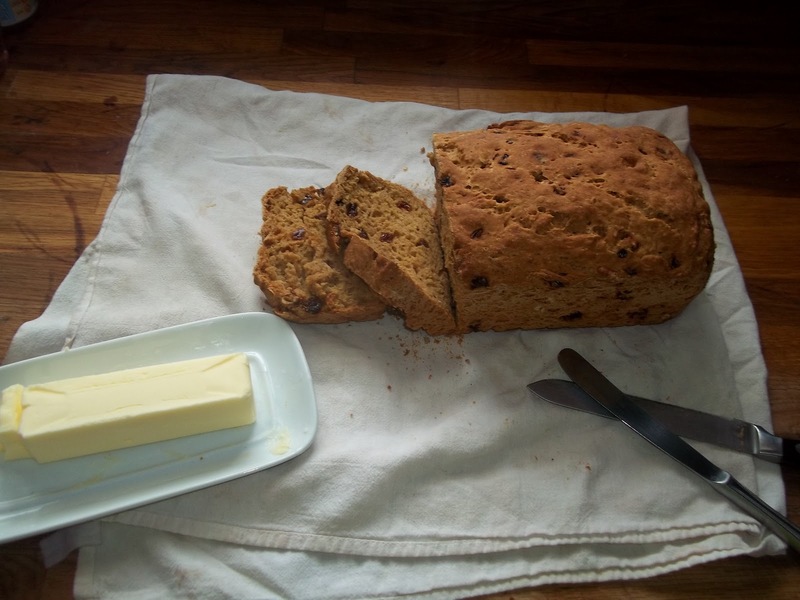 The only thing that is nice about snow is the warm fireplace and fresh baked goodies. My husband on the other hand comes from a part of the country that sees a lot of snow. He loves snow in the same way I love crabs and baseball. He associates snow with joy and comfort, a sense of being home. This past week has been a rough one for him. I don’t know anyone who loses their job and is “OK” with it. When Ry woke up Saturday morning and saw the ground covered with snow his whole face lit up. So much so it gave me a lump in my throat. When the kids woke up and discovered this white blanket, they were also overjoyed. Talk of sledding and building snowmen filled the house and as I sat on the couch, by the fire, drinking my hot coffee; I watched pure joy flow from my family as they played in the snow. It felt like God had sent that snow just for them. Ry was happy and at that moment the weight of the world was lifted off his shoulders. He was not worried about jobs or money, he was just sledding in the snow with his kids. It was beautiful. The kids and Ry were not the only ones happy to see the snow, the dogs were crasy. Running through it, rolling in it, chasing it and eating it, they thought this white stuff was great. The chickens however were not so sure. We opened the chicken coop up so that the chickens could go out into the snow if they wanted too. Ry, coming from a colder climate, said that he did not want to have wimpy birds. So the chickens were happy to explore, however they would get a couple feet from the coop and get cold and not want to walk back through the snow to get back inside. They all had to be carried back to the coop from wherever they had ventured too. 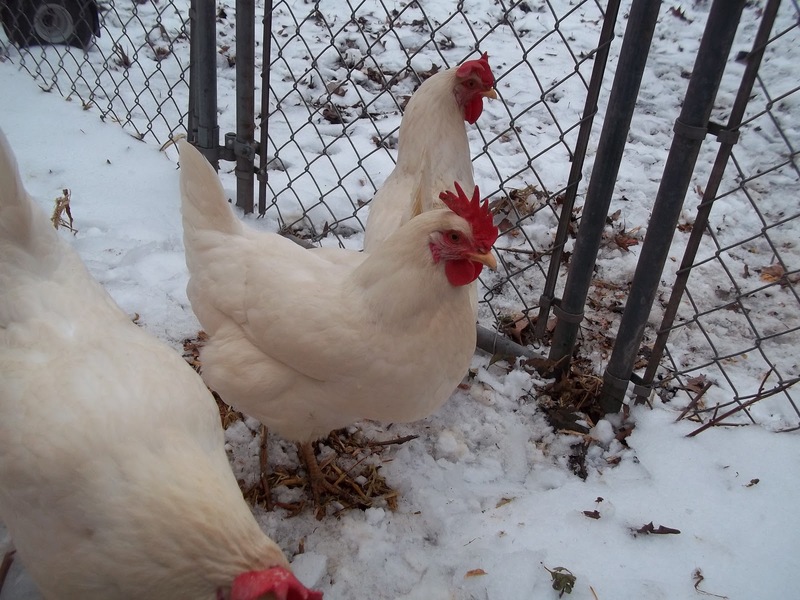 Eventually over the next couple days they got to the point where they would walk around and peck through the snow, but they stayed close to the coop and the shelter it provided. My idea of fun in the snow! I think it is funny how the snow calls some people out into it, and pushes others inside to warmth and comfort. This weekend I found that the snow provides a different type of comfort for different people Ry, the kids and the dogs found joy and comfort in the snow, while the chickens and I would much rather stay inside. Either way we all found some comfort this past weekend. The power of the curve-ball in baseball is that if used correctly it is not expected. When the pitcher releases the ball from his hand it looks like it is just a normally fast ball down the middle, then at the last minute it curves to down and away. Even though the batter knows the pitcher is able to throw a curve-ball, they still are never sure when it is coming. Ry got thrown a curve-ball on Tuesday. He got laid off after 7 years of service. We knew it could happen, but we did not know when it would happen or if it would happen to us. Some of our focus has now been switch from gardening to job searching. It is funny how both things involve planting seeds and watching them grow. Both things have an uncertain future. When you plant a flat of seeds you have no idea how many seeds are going to grow into fruit bearing plants. But you give the seeds light, water, good soil and leave the rest up to the Maker. Right now we are planting job seeds. Trying to find continue faith in the Maker and know that He has a plan for our life. So while Ry works on job seeds I am going to keep planting vegetable seeds, no matter where we go or what we do, we will need food. We had planed on buying Tilapia babies this week but that has been put on hold. We are enjoying time together as a family and using the mulch and yard work for stress relief. Please pray for us and all those that are out of a job right now.